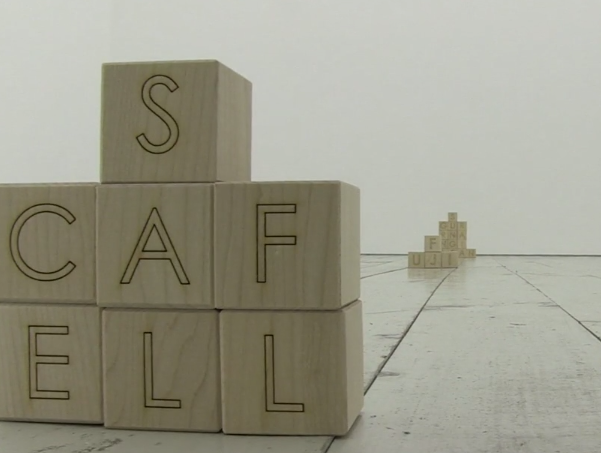 Artist and poet Alec Finlay presents his exhibition ‘a-ga : on mountains’, which consists of a selection of poems and a series of wooden blocks, a letter on each, arranged in such a way they spell the name of a mountain. Finlay explores the continuous relationship between art and language, the meanings behind the names of these mountains and their association with poetry or art. Alec Finlay is an Edinburgh based artist whose work often explores society’s relationship with the landscape, and presents work in a variety of media such as sculpture, video, poetry and collage, among others. a-ga : on mountains is currently on at the Sleeper Gallery, Edinburgh.